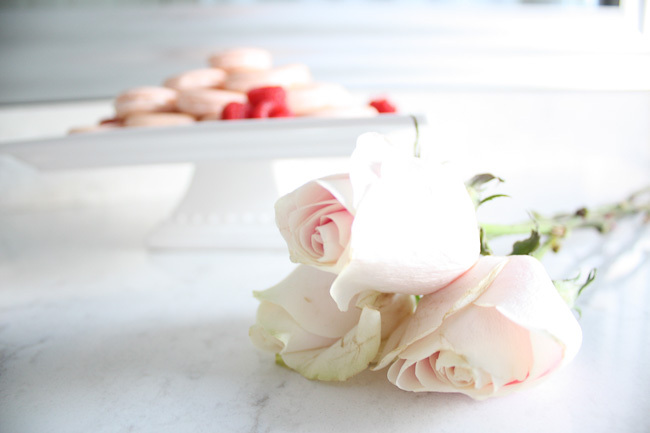 What could be more fitting as a Valentine's Day sweet treat than some macarons. Since Paris is often associated with these pretty French treats, and Paris is the city of love, I thought making them for Valentine's Day would be perfect. 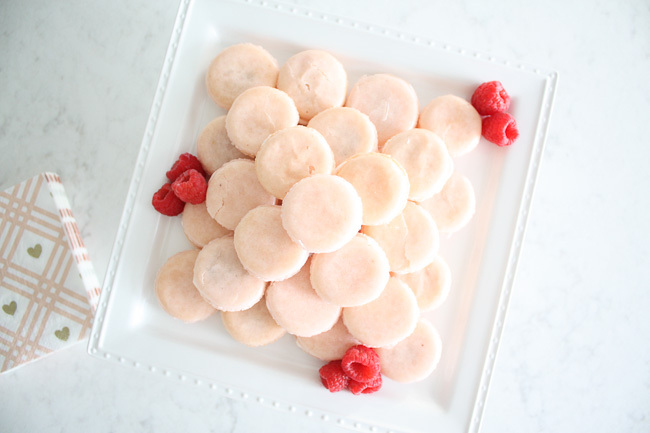 They are the prettiest little dessert and would be perfect to make as a gift or just to be able to indulge in yourself! I am going to give you a heads up now.. they are a high-maintenance cookie to make. What I mean by that is, although the steps involved in making them are fairly straightforward and easy, each step has to be done perfectly. However, they are so worth it to make because even if they don't visually come out one-hundred percent perfect, they are still so delicious! They are one of my favorites, and honestly not something I have all that often, so when I do, it really is such a treat. Of course eating them in Paris with a view of the Eiffel Tower is really the sweetest treat, but I'll take what I can get! Making them at home will never compare to Paris, but they are just as tasty, and honestly so much fun to make. Taking the time to choose the colors and flavors, make the batter and bake them, and then assemble them at the end makes them that much more enjoyable to indulge in! As you can very clearly see from the photos above, I went with a light pink theme for Valentines Day and decided to go with raspberry as my flavor. You can't see if from the pictures but there is raspberry jam in the center of each macaron surrounded by sweet butter cream. Truly to die for. 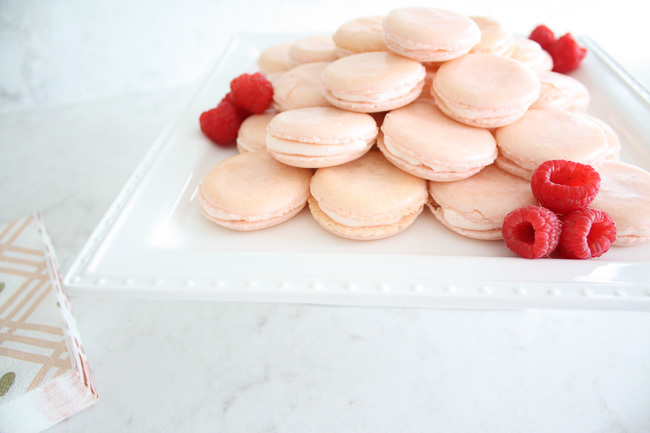 I'm telling you that you have to try and make homemade macarons at least once! If you're anything like me, you will want to keep making them to perfect them. Plus, with so many different flavors, you'll want to try them all! 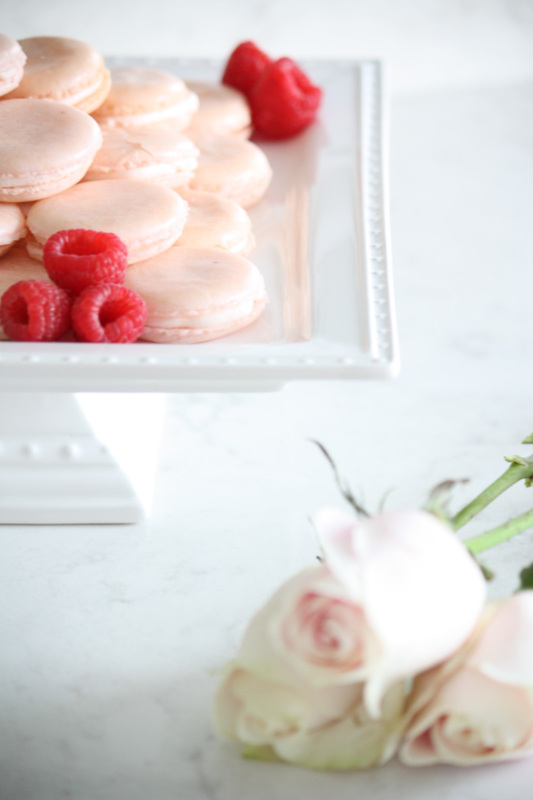 I am sharing the recipe I used below - as I said before, make sure you follow the directions to a T. If you do I'm sure you'll have some pretty little macarons to admire and enjoy! 1. On the back side of each piece of parchment paper, use a circular cutter and a pencil to trace the outline of twenty-four 2-inch circles. mark them about 1 inch apart. Turn the papers right side up on the trays. The pencil tracings will show through the paper and act as a guide when piping the cookies. 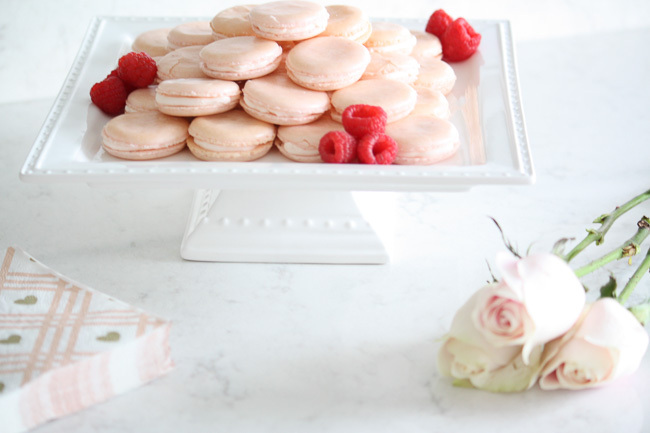 Tip: Purchase this macaron mat. It saves you a step! 2. In a food processor fitted with a steel blade, pulse the almond meal and icing sugar until very fine. Set aside. 5. Fold the almond-flour mixture into the egg whites in three additions. Once all the flour has been folded into the egg whites, continue folding until the macaron batter has broken down to a consistency like a thick cake batter. When you hold the spatula up, the batter should run off in thick ribbons. Tip: this is where you should add food coloring! 6. Fit a plain tip on your large piping bag and fill the bag with macaron batter. Hold the piping bag upright and pipe the batter straight down onto prepared trays, using the circles on the parchment paper to guide you. 7. Once you have piped all the macarons, give the trays a light tap on edge of counter to release any air bubbles. 8. Allow the trays to sit for at least 30 minutes, or until the macarons have formed a skin on top and are dull in color. If you touch them with your finger they should not be sticky. This is crucial! 9. Preheat oven to 325 ℉. 10. Place trays in oven and bake for 10-12 minutes or until crisp on top. 11. 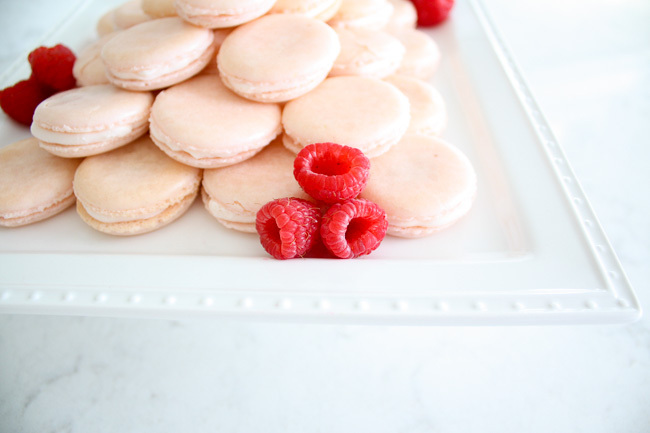 Remove macarons from the oven and allow them to dry completely. 12. Wash and dry your piping bag and plain tip as you will reload it with butter cream. 13. Fill piping bag with butter cream and turn half of macarons over so that they are flat side up. Pipe a small dallop of butter cream on the bottom and then top with the balance of the macarons. Press the two sides together gently to help spread butter cream to outer edges of the cookies. 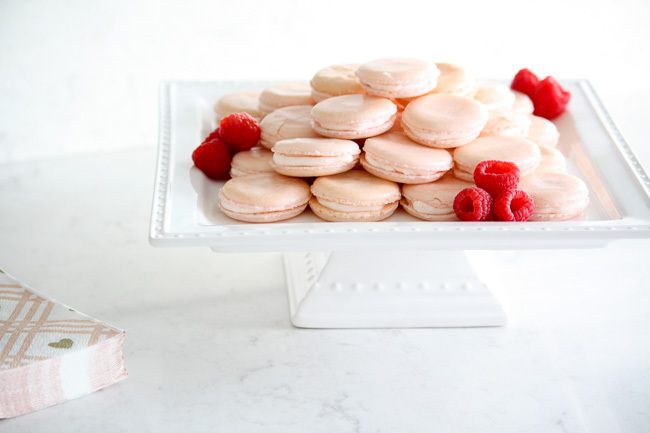 Tip: For raspberry macarons pipe a circle of buttercream on the bottom halves of cookies and fill center of each with 1 teaspoon raspberry jam. 1. In a stand mixture with a paddle attachment, beat the butter until very fluffy and pale yellow. 2. Turn the mixer speed to low and add the icing sugar. Continue to beat until well combined. Scrape down the sides of the bowl. 3. Add the milk and vanilla. Beat again. Turn the mixer speed to high and continue to beat until the icing is light and fluffy, approximately 10 minutes. Thank you to the Butter Celebrates! cookbook for the delicious recipe! Hands down one of the best cookies I have ever had!!! Love them! It's great that you describe it. I appreciate your work ! It looks pretty good.